Epiroc SC boom- and stick-mounted hydraulic shears are ideal for cutting steel structures at demolition sites or recycling metal girders, sheets and cables at scrap yards. With a range of seven shears for carriers from 8,800 to 245,000 pounds (4 to 110 tons), the Epiroc shear lineup offers great cutting force and rugged dependability. By forcing the material to where the cutter exerts the greatest force, the optimally-shaped Epiroc SC jaw cuts through steel efficiently. Each shear is equipped with replaceable cutting blades and piercing knives. An integrated speed valve delivers fast working cycles. Plus, 360-degree endless hydraulic rotation allows for optimal positioning and precise handling. In addition, an AutoGuide system available with the SC 2500 to SC 8300 models ensures optimal blade clearance. At bauma 2019 Liebherr presented two material handling machines: LH 18 M Industry and LH 26 M Industry, both specially designed for recycling applications. With these models, Liebherr says the company is positioning itself specifically in the field of small material handling machines, thereby expanding its product portfolio. As an example, for its electric material handling technology, Liebherr presented the LH 26 Industry with mobile undercarriage. Bakersfield, California-based Sierra International Machinery has introduced the REB-X Press two-ram baler. The REB-X Press two-ram baler is designed to be easily transportable while maintaining a heavy-duty construction, remarkable performance and the ability to process a variety of material. According to Sierra, this portable two-ram baler is also highly adaptable and is the ideal machine for various applications at multiple facilities that need a baler to use on a rotational basis or during maintenance shutdowns, demolition projects, disaster cleanup, landfill projects, and rural locations. Liebherr USA, Co. Construction Equipment division is displaying two high performing material handlers and the most efficient wheel loader in the industry at the Institute of Scrap Recycling Industries 2019 convention and exposition in Los Angeles, California, to be held April 8-11. Best Process Solutions (BPS) offers a complete line of shredder isolation mounts for the auto shredding and recycling industries. Steel and ferrous scrap market participants in North America enjoyed a much healthier 2018 amid higher prices and sales volumes. Nucor Corp. reported their average sales price for steel sheet increased from $689 per net ton in 2017 to $828 per net ton in 2018. At the same time, steel production in the United States expanded 6.2 percent to 86.7 million tons in 2018, according to figures from the World Steel Association. As steel production increased and pricing improved, scrap demand rose and profit margins were bolstered. U.S. Steel Corp. reports their adjusted net earnings rose to $957 million in 2018, up from $341 million in 2017. According to John Anderson of ABC Recycling, it's generally difficult to find heavy equipment mechanics. "If we don't have the people we need on our own payroll, we can end up waiting a long time for machine service," he says. "Having our own team of factory-trained technicians makes a huge difference." Members of the metals sorting team from global sensor-based sorting leader, TOMRA Sorting Recycling, will be on hand in TOMRA booth # 800 to meet with attendees during ISRI 2019 in Los Angeles , Calif., from April 8-10. Team members will be available throughout the show to address attendees' specific sorting challenges and how TOMRA's X-ray and color sorting technologies can help to deliver solutions. Swedish scrap processing company Skrotfrag installs a robotic sorting line for scrap metal. The sorting line, equipped with a three-armed ZenRobotics Heavy Picker, will be the third of its kind in Sweden. Skrotfrag will be one of the first companies to apply robotic sorting technology to scrap metal. The application is a welcomed addition to advance Skrotfrag's operations. TOMRA Sorting Recycling has published an e-book examining the role that recycling can play in providing solutions to the world's worsening resource crisis. It explores the technical feasibility and progress made toward 100% recyclability of plastics and highlights the opportunities of using high-quality recycled plastics for manufacturers of plastic products and packaging. Despite a year filled with political gridlock and uncertainty in U.S. politics, the Institute of Scrap Recycling Industries (ISRI) achieved a number of important victories benefiting recyclers in 2018. According to the organization, this sets the stage for the organization's 2019 Advocacy Agenda, which recognizes new challenges and opportunities in the industry at the local, state, federal, and international levels related to Market Development & Economic Opportunity, International Trade, Energy and the Environment, Transportation & Infrastructure Development, Workplace Safety Initiatives, Workforce & Immigration Issues, and Regulatory Policy. Gensco has delivered the company's newest Scrap Metal Portable Logger/Baler machine, Model S.5250GP, to Groff Recycling in Boyertown, Pennsylvania. As a sign of both the need to reduce metal theft, and its strong working relationship with the Institute of Scrap Recycling Industries (ISRI) and other recyclers, the International Association of Chiefs of Police recently passed a resolution calling on law enforcement agencies to recognize recyclers as partners, use tools such as ScrapTheftAlert.com, and utilize resources developed by ISRI. Estimates indicate that there are about 1 million tons of clean, non-infectious healthcare plastics generated in U.S. healthcare facilities each year. While the potential of this largely untapped waste stream is obvious, how to access this waste stream can be less clear. The new owners of a scrap metal business in Charlottetown will be reducing the amount of waste going into provincial landfill sites, according to the government of PEI. The recently appointed Vice President and General Manager of Eriez-USA, Tim Gland, announced this week that Dan Zimmerman has been promoted to the position of Operations Director of Eriez-USA. Zimmerman has been with Eriez since 2004, serving most recently as Director of Business Development. Specialist material handling company Fuchs will showcase three of their latest innovations at the upcoming bauma 2019 event —including the launch of the new MHL375F HD material handler. All three Fuchs material handlers will be on the Terex stand FM117 in Munich, from 8th - 14th April 2019. Eriez has appointed James Cooke to the position of Managing Director of Eriez-Australia, according to an announcement by Eriez Senior Director of Asia Pacific Operations and Strategy Jaisen Kohmuench. Before this promotion, Cooke served as Eriez-Australia Factory Manager since 2005. This year has gone down as one of the toughest years in many for the global nonferrous scrap industry and the recycling industry overall. With new initiatives getting launched in every corner of the world to reduce waste and increase material recycling for the manufacture of new products, one would think there would be less ending up in our landfills. Unfortunately, that simply has not been the case. The EW240E Material Handler is Volvo Construction Equipment's first material handler designed specifically for the North American waste and recycling sector. According to Matthew McLean, product manager, Volvo Construction Equipment, the EW240E is not an example of a manufacturer simply taking an existing machine and modifying it to fit a market. Matt Zubick was appointed as the new Canadian Association of Recycling Industries (CARI) Chair at this year's Annual Convention, held in Niagara Falls, Ontario, in June. Zubick has been in the scrap business his entire working life and is currently manager at London, Ontario-based John Zubick Scrap Metals Ltd., started by his grandfather after he served in the Canadian Navy during the Second World War. Trays made out of PET sheet are ideal for numerous applications: fresh food and dairy (fresh and sliced meats, cheese, fresh pasta, ...), blister packaging (lamps, tools, stationary, body care, ...) and medical packaging (tablets, scalpels, catheters, ...), providing great performances in transparency and improving the shelf life of products. TOMRA Sorting Recycling, supplier of sensor-based sorting equipment, recently installed multiple sorting technologies in the new metal sorting plant at WENDT CORPORATION's Buffalo, N.Y., Technology Center. The new WENDT plant features the latest technologies and processes for cleaning, sorting, and upgrading shredded non-ferrous metals, such as zorba and zurik. California-based Converge Engineering LLC has announced the launch of its new website, ConvergeBelting.com. This domain provides new and existing customers in recycling and other industries with a comprehensive resource for replacement conveyor belting and accessories. Indexator has launched a smaller model, the XR 300, as part of the company's XR range of hydraulic rotators. The XR range comprises compact, powerful rotators with heavy-duty bearings, designed for extreme applications where rotator function requirements and load capacities are especially high. Units are optimally designed for both rigid and dangle mounting slew bearings, high performance and long service life, for handling large loads. The Institute of Scrap Recycling Industries (ISRI) has joined with the U.S. Environmental Protection Agency (EPA), and other stakeholders, in the signing of a memorandum of understanding (MOU) to extend the National Vehicle Mercury Switch Recovery Program (NVMSRP) to 2021. The highly-effective program was designed to recover mercury switches in older model vehicles during the recycling process before the mercury can leak into the atmosphere. Such switches were mainly used to control automatic lights in vehicles. TOMRA Collection Solutions has become the first reverse vending provider to offer digital vouchers as a payout option for container deposit schemes, where consumers receive refunds when they return their empty bottles and cans for recycling at a reverse vending machine. The conveyor feed recently developed by Goudsmit Magnetics consists of a conveyor belt feed that is supplied by a product distributor. This prevents clogging of the vibratory chute during the recycling process and increases the yield of non-ferrous metals. Sticky or damp product streams, such as incinerator bottom ash (IBA) and refuse-derived fuel (RDF) adhere to the surface of vibratory chutes, preventing them from distributing the product evenly. The product takes on a preferred orientation (the path of least resistance) preventing formation of a homogeneous layer, which results in reduced yield of non-ferrous metals. In 10 years, RecyCâbles, formed as a joint venture between SUEZ and Nexans in 2008, has become the European leader for cable recycling and recovery. Every year, about 30,000 tonnes of cables are recovered by SUEZ Nord ecopôle in Noyelles-Godault (France). By 2020, the site aims to reach its maximum annual processing capacity of 36,000 tonnes. The use of shredded scrap in the steel making process has significant metallurgical advantages including shorter tap-to-tap times, faster filling of scrap baskets or melting furnace as well as reduced electrode costs. The BPS Container Loading System is engineered to load 20-ft. and 40-ft. shipping containers quickly and efficiently for the export of ferrous and nonferrous metals. The three major components of this system are the vibratory hopper feeder, loading belt conveyor and system controls. Montreal, Quebec based Globe Metal recently purchased a brand new Kajman 1000 Alligator Shear. This new machine allows Globe Metal to shear stainless pipe and plate to produce foundry-grade cut plate prepared for any customer's specifications. It is also capable of producing any size of Ferro additives as per their customers' exacting requirements. TOMRA Sorting Recycling has introduced a new generation of X-TRACT machine with advanced sorting technology that allows a broader range of market segments to take advantage of its ability to boost purity levels. Today's XTRACT features innovative Dual Processing Technology to enhance final purity levels; multi-density channels for more precise classification and sorting of materials; and a broad range of application packages. Shortly after World War II, Ben Sacco came to California and started Sierra Bag Company, servicing the agriculture industry. In the late fifties, Sierra Iron & Metal was born when he dedicated a portion of his operation to scrap metal collection. He then added a baler to process scrap, which he found while visiting his homeland of Italy. Sacco eventually became the official North and South American distributor for the baler manufacturer, starting Sierra International Machinery, while at the same time continuing to operate his scrapyard, Sierra Iron & Metal. About 10 years ago, the business was passed on to Ben Sacco's two sons, John and Philip Sr., both of whom have been lifelong employees and contributors to the business. 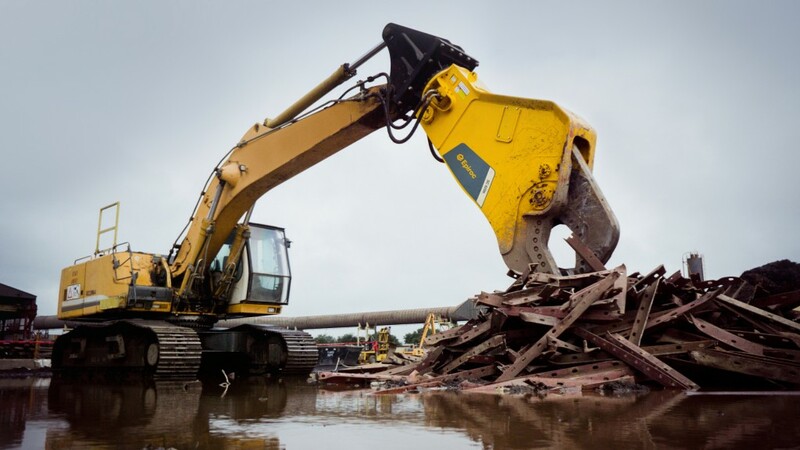 The scrap recycling part of the Sacco family business today operates as Sierra Recycling and Demolition Inc., run by Phil Sacco, while Sierra International Machinery, the recycling equipment manufacturer and distributor, is run by John Sacco - both out of Bakersfield, California.